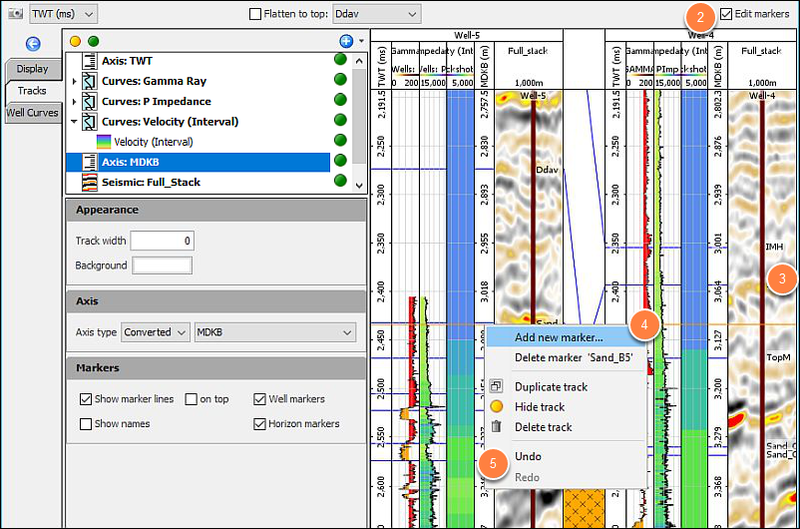 In addition to the Marker Classification Sheet (see Opening Marker Classification Sheet), you can directly edit the markers in Well Correlation. Note: You can only edit the markers in the Well Correlation view if you are the owner of the active marker set for a specific well. You can take ownership of the active well marker set, create your own marker set, or change to use another marker set in order to edit the markers (see Defining Well Markers, Managing Well Components and Selecting Default Well Components). In the Control Panel, go to the View menu and click Well Correlation. The Well Correlation window will be displayed. Select the Edit markers check box. Alternatively, right click in any of the well curve tracks and click Edit markers. Move a marker up/down by dragging it to a desired time/depth level in the well curve track. Add new marker — Create a new marker in the specific curve track. The Edit Marker window is displayed when you click this menu option. Type a label for the new marker and define the measured depth where you want to place the marker. By default, the measured depth displayed is based on the position where you right-click to open the context menu, and in the vertical dimension set in the navigation bar. You can type a new depth for the marker. Click OK. Note: When you are labeling a new marker, you are not allowed to use spacing or a comma in the name. However, you can use hyphen and underscore. To see a sample of a marker file, go to Well Import File Formats. Add last named marker — This menu option is only enabled once you have added a new marker. You may want to use this option to add the same marker you have just created in another well curve track, or to move the same marker to a different depth on the same track. Delete marker — In the well curve track, right click at the marker you want to delete. Click Delete marker <name> in the context menu to delete the specific marker. You can undo/redo the change by clicking Undo/Redo in the Markers tab in the Configure Well window of the specific well item (see Managing Well Components). Once you are done with the changes, clear the Edit markers check box at the navigation bar in the Well Correlation window. Alternatively, right click in any of the well curve tracks and click Edit markers. Save the current session to save the changes you have made to the markers.